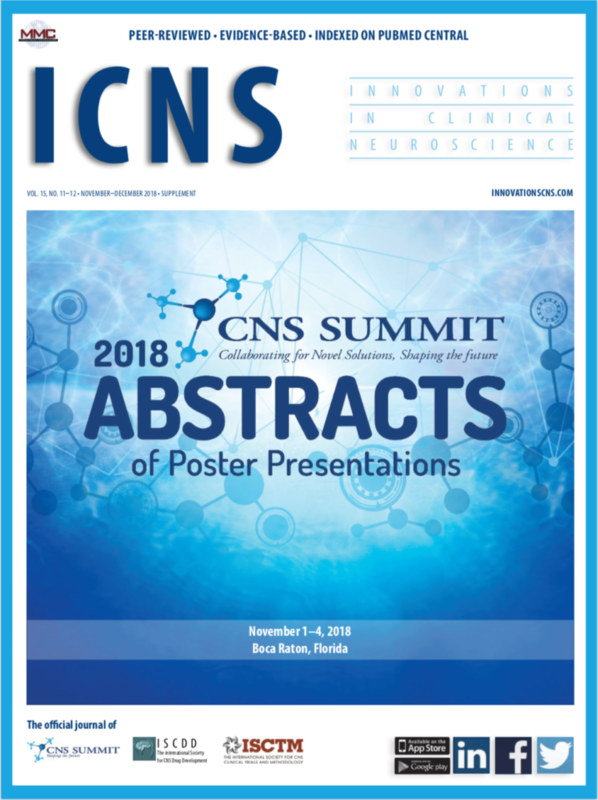 Submission requirements for Innovations in Clinical Neuroscience (Online ISSN 2158-8341, Print ISSN 2158-8333) are in accordance with the International Committee of Medical Journal Editors (ICMJE). See Uniform Requirements for Manuscripts Submitted to Biomedical Journals. Innovations in Clinical Neuroscience is a peer-reviewed electronic-only journal (www.innovationscns.com) designed to provide healthcare clinicians and researchers with up-to-date, evidence-based information in a straightforward “how-to” fashion on new or emerging treatment options, drug development trends, theoretical concepts, drug trial methodology, and practice management issues in the field of neuroscience, including psychiatry, neurology, pain, and Alzheimer’s, to improve patient outcomes. Manuscripts that meet our editorial purpose include but are not limited to: (1) reports of preclinical and clinical research studies that expand existing knowledge in the field of neuroscience; (2) case reports, case series, and case studies that stimulate research and the exchange of information beyond what is currently found in the literature in the field of neuroscience; (3) in-depth reviews that synthesize new or emerging information on treatment options, drug development, drug trial methodology, practice management, reimbursement, education, ethics, and legal issues in the field of neuroscience; (4) reports on contemporary issues in neuroscience that may affect drug or device development, delivery of services, reimbursement, and clinical practice of psychiatry, neurology, or related fields; and (5) commentaries that offer unique, substantiated discussions on theoretical concepts, current or emerging trends in clinical practice (including treatment and diagnosis issues), trial methodology, drug development, regulatory issues, or other topics related to neuroscience that affect patient outcome. Original Research. Reports of investigations that address questions about clinical care or clinical trial methodology or expand existing knowledge. References and abstract are required. Illustrative material is recommended. Recommended length: up to 6000 words, not including references. Review Articles. Comprehensive articles that synthesize and summarize the latest research to facilitate the clinician’s approach to diagnosis and treatment and articles highlighting emerging diagnostic and therapeutic modalities. May also include in-depth reviews of clinical practice, practice management, drug development, trial methodology, reimbursement and educational, ethical, or legal issues. References (at least 25 current references are recommended) and abstract required. Illustrative material is preferred. Recommended length: up to 6000 words, not including references. Case Series, Studies, or Reports. Short presentations of actual cases that stimulate research and the exchange of information beyond what is currently found in the literature and illustrate the signs and symptoms, diagnosis, and treatment of a disorder. Case presentations should provide unique or new diagnosis or treatment information that is not well-covered in the current literature. All case series, studies, or reports should contain a brief, scientific, well-supported discussion of the results and conclusion. References (at least 15 current references are recommended) and abstract required. Illustrative material is preferred. Recommended length 1000 to 3000 words, not including references. Brief Reports. Short reports of original studies, trial methodology, or case series. References (at least 15 current references are recommended) and abstract required. Illustrative material is preferred.Recommended length: 1000 to 1500 words (not including references). Commentaries. Essays that address important topics in neuroscience and generally are not linked to a specific, already-published article. Commentaries should offer unique perspectives that are well focused, scholarly, and clearly presented. References (at least 20 current references are recommended) and abstract required. Recommended length: 1500 to 2000 words. Letters to the Editor. Opinions on cases or articles published in Innovations in Clinical Neuroscience, opinions on other current topics, or short reports of research or cases of clinical interest. Must be concise and to the point. Text should not exceed 600 words (not including references), with no more than 10 references. Letters regarding a specific article published in Innovations in Clinical Neuroscience should be received within four months of the article’s publication release and may be sent to the original author for reply. Submission of a letter does not guarantee publication or response. Please notify Executive Editor if letter is not intended for publication. The Executive Editor reserves the right to edit the letter for style, clarity, and length. Submissions for consideration may be submitted online via Editorial Manager. Emailed submissions no longer accepted. Corresponding Author. Each manuscript submission should have a designated corresponding author. The corresponding author will be the Executive Editor’s single point of contact and will be responsible for communicating any information from the editorial office regarding the submitted manuscript to the coauthors. Lead (First) Author. The first or lead author of each submission must have a master’s level degree of education or higher (PhD candidates are acceptable). Medical students, individuals with bachelor’s or lesser degrees, and individuals with no degrees are permitted as authors, but may not be listed as the first or lead author. Please contact the Executive Editor prior to submission if in doubt. Cover Letter. Manuscripts should be submitted with a cover letter indicating the article type. The cover letter should give details on any previous or duplicate publication of any of the content and should state that the paper is not under consideration for publication elsewhere. In the cover letter, authors should disclose any potential financial conflicts of interest relevant to the submitted manuscript. For Letters to the Editor, please indicate whether the letter is intended for publication. Here, the corresponding author may recommend potential peer reviewers. Please provide each recommended peer reviewer’s full name, degree(s), affiliation(s), and email address. Peer-reviewers recommended by the corresponding author may or may not be contacted by the editorial office during the peer-review process. Conflict of Interest Disclosures. All authors should disclose any potential financial conflicts of interest relevant to the submitted manuscript in the cover letter of the submitted manuscript. Author and Copyright Forms. Author and copyright forms can be downloaded when submitting an article via our Editorial Manager submission platform. Author and copyright forms can also be requested from the Executive Editor. It is the responsibility of the corresponding author to distribute the author and copyright forms to all of the coauthors. All authors for each submission are required to complete, sign, and return these forms prior to publication. The corresponding author may not sign on behalf of any coauthor. If the manuscript is accepted and published in Innovations in Clinical Neuroscience, authors must transfer copyright of the article, tables, figures, and other ancillary material relevant to the article to Matrix Medical Communications. Special requests for authors to maintain copyright will be considered on a case by case basis. Email the Executive Editor. Registration of Clinical Trials. As recommended by the ICMJE, Innovations in Clinical Neuroscience requires as a condition of consideration for publication the registration of all clinical trials in a public trials registry that requires the minimum registration data set as determined by the ICMJE, which can be accessed via http://www.icmje.org/index.html#clin_trials. Please include the trial registry name, registration number, and the url for the registry in the abstract. Protection of Research Participants. When reporting research involving human data, authors should indicate whether the procedures followed have been assessed by the responsible review committee (institutional and national), or if no formal ethics committee is available, were in accordance with the Helsinki Declaration as revised in 2013. If doubt exists whether the research was conducted in accordance with the Helsinki Declaration, the authors must explain the rationale for their approach and demonstrate that the institutional review body explicitly approved the doubtful aspects of the study. Approval by a responsible review committee does not preclude editors from forming their own judgment whether the conduct of the research was appropriate. Patient Consent. Identifying information, including names, initials, or hospital numbers, should not be published in written descriptions, photographs, or pedigrees unless the information is essential for scientific purposes and the patient (or parent or guardian) gives written informed consent for publication. Informed consent for this purpose requires that an identifiable patient be shown the manuscript to be published. Authors should disclose to these patients whether any potential identifiable material might be available via the Internet as well as in print after publication. Patient consent should be written and archived with the authors. The authors must provide the journal with a written statement that attests that they have received and archived written patient consent. Nonessential identifying details should be omitted. Informed consent should be obtained if there is any doubt that anonymity can be maintained. For example, masking the eye region in photographs of patients is inadequate protection of anonymity. If identifying characteristics are de-identified, authors should provide assurance, and editors should so note, that such changes do not distort scientific meaning. Animal Experiments. Manuscripts will be considered for publication only if the work follows international, national, and/or institutional guidelines for humane animal treatment and complies with relevant legislation; has been approved by the ethics review committee at the institution or practice at which the studies were conducted where such a committee exists; and for studies using client-owned animals, demonstrates a high standard (best practice) of veterinary care and involves informed client consent. Prior to acceptance of a manuscript, to verify compliance with the above policies, the authors must include a signed statement that legal and ethical requirements were met with regard to the humane treatment of animals described in the study. Author must also describe in Materials and Methods section(s) of the manuscript the ethical review committee approval process and the international, national, and/or institutional guidelines that were followed. Inclusion of Previously Published Materials. Any material submitted to Innovations in Clinical Neuroscience that is reproduced from previously published, copyrighted material must be accompanied by a letter of permission from the copyright holder (usually the original publisher, not the author) UPON SUBMISSION. Obtaining permission from the author is not acceptable unless the author holds the copyright. When in doubt about copyright, contact the editorial office of the original publisher. All such material should include a full credit line (e.g., in the figure or table legend) acknowledging the original source. The author is responsible for obtaining the permission and is responsible for any associated fees. If the author does not have permission in writing to reproduce previously published, copyrighted material, that material will not be included in the article publication. Title Page. The title page should contain the following elements: Article title; author names, degrees (e.g., MD, PhD, etc), and institutional affiliations; sources of financial support; name of corresponding author with his or her complete contact information (mailing address, telephone and fax numbers, e-mail address), and word count (text only). Spacing and Pagination. The manuscript should be typed using double line spacing throughout. Do not use a running head. Pages should be numbered beginning with the title page. Manuscripts should NOT contain any automatic formatting, except for the page number at the top right corner of each page. Abstract. Include a structured abstract with all articles, except letters to the editors. Original research and case study abstracts should be organized using the following categories: Objective, Design (setting, participants, measurements, analysis), Results, and Conclusion. Abstracts of clinical trials must include trial registry information (registry name, registration number, and url for the registry). Review articles abstracts should be organized using the following categories: Objective, Method of Research, Results, Conclusion. Case report abstracts should contain a brief description of the patient and disease state, method and results of treatment, and conclusion. Abstracts of commentaries should include the following categories: Objective, Main Points of Discussion, Conclusion. Keywords. Include all relevant keywords following the abstract. Abbreviations/Acronyms. All abbreviations and acronyms should be spelled out at first mention. Books. The sequence for book references should be author(s) or editor(s) last name followed by first name initial; up to four author/editor names; for five or more authors/editors, list the first three, followed by et al), title of book, edition number, location of publisher, publisher, copyright year, volume, and specific page numbers for quoted material (if applicable). 1. Stahl SM. Stahl’s Essential Psychopharmacology, Fourth Edition. New York, NY: Cambridge University Press;2008:15–23. The sequence for chapters of a book should be: author(s) last name followed by first name initial; up to four author names; for five or more authors, list the first three, followed by et al), chapter title, editor(s) (last name followed by first name initial; up to four editor names; for five or more editors, list the first three, followed by et al), book title, edition, place of publication, publisher, year, page numbers. 2. Holland JC, Gooen-Piels J. Principles of psycho-oncology. In: Holland JC, Frei E (eds). Cancer Medicine, Fifth Edition. Hamilton (Ontario): Decker;2000:943–958. Journal articles. The sequence for a journal article should be: author(s) last name followed by first name initial; up to four author names; for five or more authors, list the first three, followed by et al), title of paper, journal name abbreviated as in the Index Medicus, year of publication, volume number, issue number and first and last page numbers. 3. Stark D, Kiely M, Smith A, et al. Anxiety disorders in cancer patients: their nature, associations, and relation to quality of life. J Clin Oncol. 2002;20:3137–3148. Proceedings. The sequence for conference proceedings is author(s) last name followed by first name initial; up to four author names; for five or more authors, list the first three, followed by et al), name of presentation, name of meeting, year month day, location. 4. Heller T. Promoting healthy aging and community inclusion of adults with developmental disabilities. Presented at the National Association for the Dually Diagnosed; 2003 Oct 24; Chicago, Illinois. Websites. The sequence for website listings is author(s) last name followed by first name initial; up to four author names; for five or more authors, list the first three, followed by et al) or if no author is available, the name of the organization responsible for the site, title of the specific item cited (if none is given, use the name of the organization responsible for the site), name of the website (use “website” not “Web site”), URL (provide URL and verify that the link still works), published date (if available), updated date (if available), accessed date (Tip: Include as much relevant information as possible). 5. Rainie L. The rise of the e-patient. Pew Research Center Internet and the American Life Project website. http://www.pewinternet.org/Presentations/2009/40-The-rise-of-the-e-patient.aspx. October 7, 2009. Accessed January 11, 2012. Authors are responsible for ensuring that the reference list contains all references cited in the text, in order, accurately. Do not duplicate references. Tables and Figures. All illustrative material must be numbered consecutively according to citation in text. If a figure or table has been previously published, the complete reference information must be cited, and written permission from the publisher to reproduce must be submitted with the manuscript prior to peer review. Obtaining permission (and any associated fees) to include previously published materials in a Innovations in Clinical Neuroscience submission is the responsibility of the author. Photographic illustrations may be submitted as color or black-and-white electronic .jpg, .tif, or .pdf files (min. 300 dpi). Any drawings must be professionally executed and submitted electronically. Tables and graphs must be provided in Word or Excel. Symbols and abbreviations should be defined/spelled out. For black-and-white or color photographs, the required resolution is at least 300 dpi. For line drawings, the resolution must be at least 600 dpi. Peer Review. All submissions undergo at least one single-blind peer review to ensure that the material is clinically relevant, accurate, and concise. A minimum of two reviewers will assess each submission. Strict confidentiality regarding each submitted manuscript is maintained. Based on the reviewers/editors’ comments, manuscripts are accepted, rejected, or recommended for revision. Reviewers’ comments that are considered constructive will be shared with the corresponding author. Typically, authors are given one month to make required revisions and resubmit. If more time is needed, contact the Executive Editor. Please note that revised submissions may undergo additional peer reviews, and are accepted, rejected, or recommended for additional revisions based on the most recent peer review. The Executive Editor and Editor reserve the right to reject a submission at any time and without explanation prior to publication, including previously accepted or revised articles. The corresponding author will be notified when an article is accepted, rejected, or requires revisions. Likewise, an author can retract a submission at any time prior to publication. An article cannot be retracted once it has been published. Editing and Page Proofs. Articles accepted for publication will be edited for grammar, syntax, and style consistent with journal requirements. Galley proofs will be sent to the corresponding author prior to publication for approval. The corresponding author may be asked to make minor revisions at this stage. The author will be given no more than 48 hours to respond with changes/corrections. The author is responsible for all changes in the manuscript, even those of the copy editor, up to final proof. The Executive Editor reserves the right to make grammatical corrections or other corrections considered necessary for clarity or to maintain style consistency without author approval. Upon publication. The corresponding author will be emailed a PDF of his or her article after publication. Please note: the PDF is copyright protected by the publisher of the journal and is for the corresponding author’s files only. Corresponding author may email PDF to co-authors and other colleagues who request it for research purposes. The PDF may not be mass distributed in any way (including e-mail or print) or posted on any website (including internal sites), except by the publisher, without express written permission from the publisher (fees may apply). Electronic and printed reprints are available at a discounted price to the corresponding author. Contact Executive Editor for more information. Copyright ownership to the journal does not go into effect until an article has been published. Innovations in Clinical Neuroscience is indexed with PubMed Central, PsycINFO, CINAHL (Cumulative Index to Nursing and Allied Health Literature®), CINAHL® Plus with Full Text, Scopus, and Embase. • Copies of permission letters to reproduce previously published and unpublished material.